Irony -- and parody -- may be dead in Vegas. ...but that's also pretty funny -- and deliberately so -- because the WynnLasVegas.Com site is notorious for being inexplicably slow to load. Basically, they're telling Chuck of VegasTripping: We own it, take it down, give us the keys, thanks a ton, love ya. That said, Wynn's lawyers -- taking a much-deserved break from their effort to make it impossible for Grandma to stuff Garth Brooks tickets into Junior's stocking this Christmas -- have deep pockets. Chuck was surprised by the letter and is considering his options. "The whole thing is just preposterous," he told me tonight. "The artist in me says that we should defend ourselves but the banker in me says we can't afford to. Spending a lot of money to defend a half-baked gag for something with limited appeal that was intended to amuse about 15 people doesn't make any sense, but it is a parody website. What we're doing here is not all that different than what Andy Warhol did with Campbell's soup can." I think he underestimates the humor potential. The Wynn site, like the man himself, is eccentric and unique, forcing users to wait and having Wynn's dulcetto narrating things as though he's cooing to a lover. The possibilities are endless. Chuck said he's likely to remove the content but that he isn't planning to just fork over the domain name. Is that not the greatest thing since Ted Stevens' Series of Tubes? Oddly, there's no secretarial notation, so is it really possible Wynn himself typed this? And how is it Hunter didn't remember this back when Robert Earl was making it his life's work to bring him down? Hunter said on his Twitter (get it? ): "I wrote back saying, thanks for your concern but 'sorry, no dice'. Asking for no coverage was a non-starter." P.S. to Hunter: How about scanning in the whole letterhead? I'm dying to see what the logo looked like back then. That's just FUG. I'm sure Roger Thomas would disavow. Have a logo that seems oddly familiar? 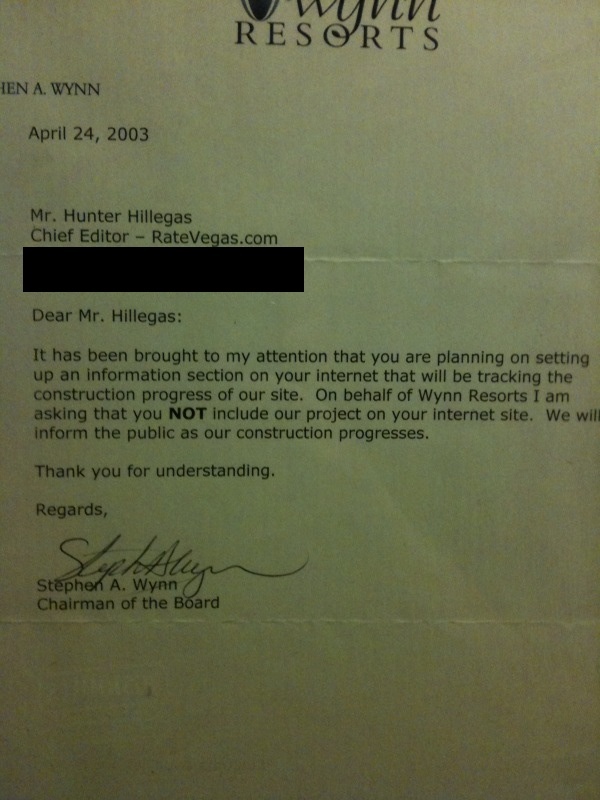 The letter to RateVegas.com is really funny. Wynn security escorted me off their property when I was taking photos of the construction of Wynn from the old Desert Inn garage. It was a silly encounter. I couldn't believe the fuss being made—other than my trespass. Maybe Steve Wynn's dear friend Sheldon Adelson would help Chuck out with his legal expenses. I agree with you, Steve; wynncore.com has potential! Chuck should create a mammoth, labyrinthine page explaining wynncore's policy regarding show ticket purchases. For example: "Ticket buyers will be required to submit a DNA sample at an approved lab from Section F subsection 3." "For ticket purchases of 4 or more, original birth certificates must be hand-delivered by the attending physician(s)." "Please do not deliver urine samples directly to the box office." And so on. Nice article Steve, Chuck if you are reading, I'd probably pull down the site, but no way in hell would I give up the domain name. That's going to cost some dollars if they want that. Then you can use those dollars to defend yourself for the next parody. "Golf Course land at Wynn"
Sure, I will scan the thing on a real scanner. The letterhead/logo is the same thing that was up on the DI building entrance before they imploded it. I used to go into that lobby - they had a model of the 18th hole of the golf course, as well as a Ferrari on display. This was even after the art gallery closed. They probably thought I was insane. Steve - You seem to be developing a distaste for Wynn as of late. Interestingly, as of late I have felt more like going there. I can't believe that Wynn didn't grab the name from the get go. 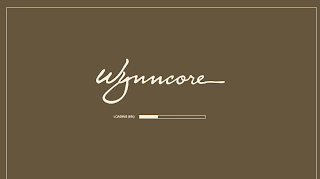 It seems somewhat obvious the Wynncore would be useful. Chuck may have a case as long as there is no advertising or way to make money off the site. I was involved in a blog some time ago that played off of a major companies slogan which they then sent a letter demanding the domain. We were out of luck as it had some Google ads on the sidebar. It wasn't a negative site and was, in fact, somewhat sympathetic. The owner got legal advice that the blog needed to be ad free to even contemplate fighting. He folded the site. Bye Bette + Buffet! Hi, Viva Elvis! Bravo to Top Chef Tasting Menus!